I am extremely pleased to announce that the time of year for Alaine's Rainforest Cake has arrived - and this is the 19th year! These are the beautiful loaves of Brazil nuts and dried fruit that you see in the header photograph of this website. It seems I have been making this cake all my life, but simple math will tell you this is not so; however, I cannot imagine this time of year without it. 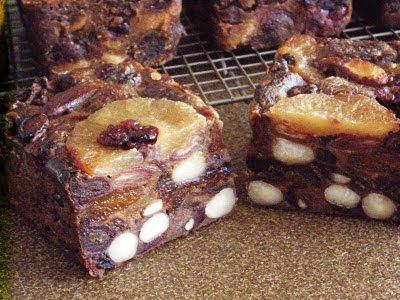 Brazil nuts, apricots, dates, pineapple, cranberries, raisins, orange zest - with a bit of natural sweetening and brown rice flour, and then splashed with brandy. I used to describe it as "fruit cake, if fruit cake were good, or if it were healthy". Of course it is vegan, with no refined sugar, no added fat, no gluten, no salt - just delicious flavors, and all so healthful. Truly a wonderful gift! Rainforest Cake is also available WITHOUT the Brazil nuts --- just specify when you order. Dr. John MacDougall and his wife, Mary, enjoy this version. The white burlap bags are also back! After a lapse of several years, the white burlap bags that the Rainforest Cakes used to come in are available as a Christmas gift wrap option. Or, you may opt for the simple wrapping paper and ribbon that we have been doing for the past few years. You may also decide to let us wrap and drop ship cakes for you, or you may just pick up your cakes from us and gift wrap them yourself. (Or, you may keep them for yourself!) Nothing is as energizing and delicious as Rainforest Cake --- it can really keep you going during this last month of the year, when we all tend to overdo it. 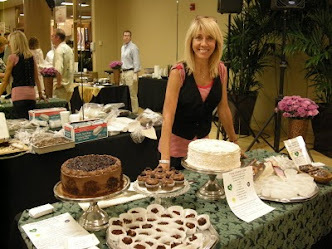 Please order Rainforest Cakes by December 18th, especially if you would like us to ship them for you. To order please CLICK HERE . One dozen Brownies: choose from Chocolate, Carob, Diabetic-friendly, Gluten-free. Muffins for Christmas morning: choose from Pumpkin Cranberry, Blueberry Oat Bran, Banana Chocolate Chip, Chocolate Chocolate Chip. Cake for Christmas or New Year's: choose from Chocolate Raspberry, Chocolate Cherry, German Chocolate, Banana Chocolate Chip, Carrot Cake, Coconut Macaroon Cake with either Vanilla or Chocolate Frosting. Pie for Christmas: Fresh Apple, Pumpkin, Blueberry, Cherry. Uncheesecakes: Pumpkin Pecan, Chocolate Pumpkin, Key Lime - all are good choices! To place an order for any of the these items please click to visit our BAKERY STORE . --- GreenHeart Bakery also offers gift certificates, too! Then you really can't go wrong! Please contact Alaine via e-mail for more information on this.